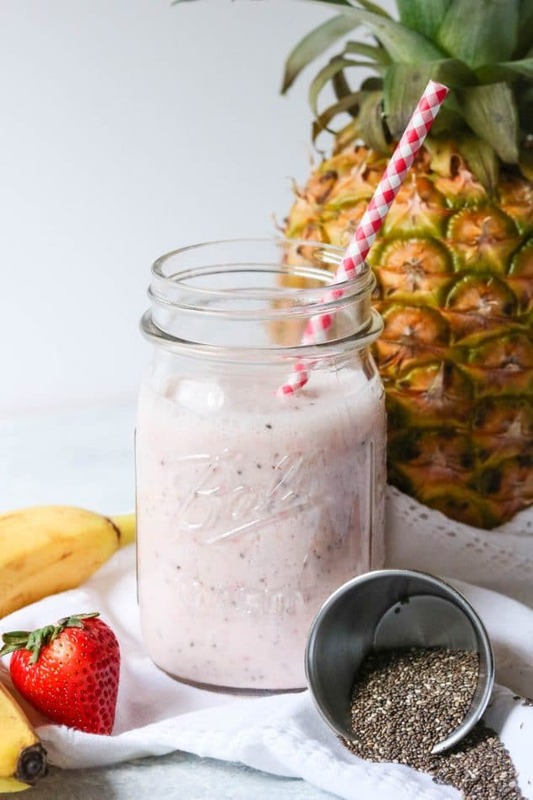 This tropical chia kefir smoothie is loaded with probiotics and omega-3 fatty acids, thanks to the help from the chia seeds and kefir. 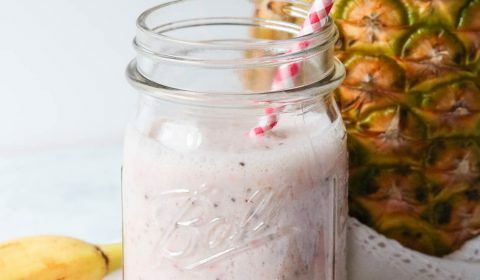 The bananas, strawberries, and pineapple give it a tropical flavor, which makes this smoothie the perfect summer drink. If you wanted, you could also add in some bonus greens, like fresh spinach, for even more nutritional value. Chia seeds also provide fiber, iron, and calcium and can help raise HDL cholesterol. 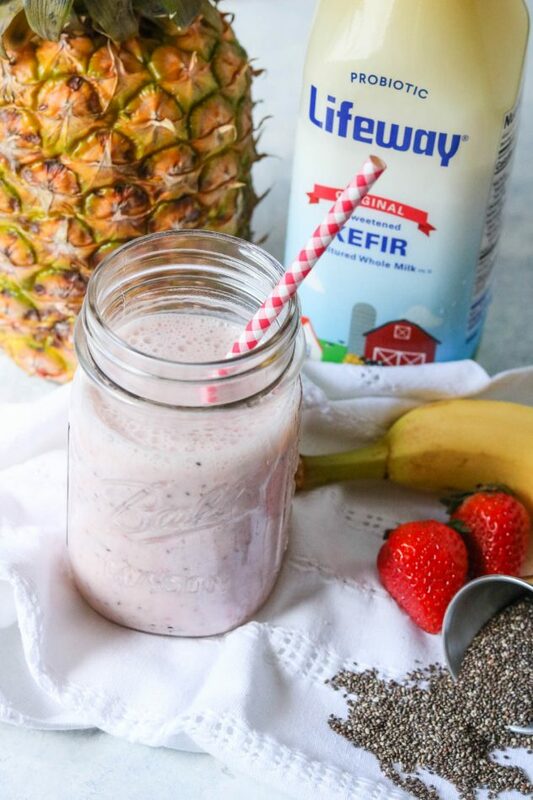 I’m fairly new to the kefir game, but essentially kefir is a fermented milk product that tastes almost identical to yogurt (think liquid yogurt), that is also full of probiotics and other vitamins and minerals like B12, calcium, folate, and magnesium. For this smoothie, I used the Lifeway brand of kefir, but this is not a sponsored post and I receive no compensation from them for using this product. There are several good kefir brands, and you can also find multiple flavors. I used the original plain kefir for this smoothie. 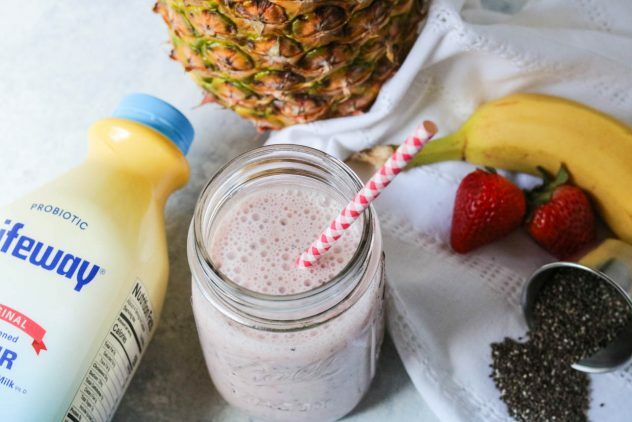 Have fun with creating this tropical chia kefir smoothie, or create your own variation by changing out the fruits or adding in additional vegetables. The kefir base will provide the probiotics and the chia seeds will provide the additional omega-3 fatty acids and fiber. Add all ingredients to a blender and blend until smooth. Serve immediately or place into the refrigerator to chill and then serve.